"This particular neutron star belongs to a group of seven nearby X-ray pulsars—nicknamed 'the Magnificent Seven'—that are hotter than they ought to be considering their ages and available energy reservoir provided by the loss of rotation energy," said Bettina Posselt, associate research professor of astronomy and astrophysics at Penn State and the lead author of the paper. 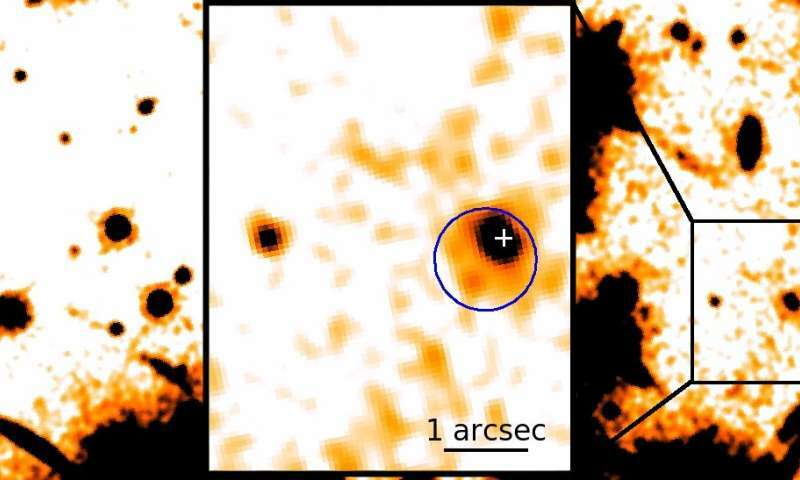 "We observed an extended area of infrared emissions around this neutron star—named RX J0806.4-4123— the total size of which translates into about 200 astronomical units (or 2.5 times the orbit of Pluto around the Sun) at the assumed distance of the pulsar." "A pulsar wind nebula would require that the neutron star exhibits a pulsar wind," said Posselt. "A pulsar wind can be produced when particles are accelerated in the electric field that is produced by the fast rotation of a neutron star with a strong magnetic field. As the neutron star travels through the interstellar medium at greater than the speed of sound, a shock can form where the interstellar medium and the pulsar wind interact. The shocked particles would then radiate synchrotron emission, causing the extended infrared emission that we see. Typically, pulsar wind nebulae are seen in X-rays and an infrared-only pulsar wind nebula would be very unusual and exciting." Chances are better than not the option B is correct, electric currents driven by electric fields caused by this not neutron star (keep in mind neutronium and strange matter are fanciful faerie tales dreamed up plasma ignoramuses). Is there anything that your total ignorance of the subject prevents you from commenting on? Idiot. Yeah, like the story you've been peddling about the Astronomy degree you received from Uni Auckland, NZ forty years ago that has NEVER offered such a degree, Yeah, you're just the type so well qualified in the trivial details of Pop-Cosmology fantasy that keeping up the name calling rants with no end in sight is the most important thing you do in your hateful life. Yeah, like the story you've been peddling about the Astronomy degree you received from Uni Auckland, NZ yada, yada, yada. WhyGuy, you need to head over to Wiki & read why neutron stars are thus labeled, because the hypothesis states that such a stellar body is already composed almost entirely of neutrons. Now what you need to get a grip on here is that fusion is via proton-proton chain, NEVER neutron-neutron. There is no known N-N fusion chain, just P-P.
A stellar body composed almost 100% of neutrons has no fusion or fission chain, therefore what would be the process by which energy is created? Certainly not using your blowtorches (I can just picture you right now heading for Wiki). Maybe you think gravity can release energy from a neutron, is that what you're about to come back with? It doesn't happen on the Sun. OK , demonstrate it? "Most of the basic models for these objects imply that neutron stars are composed almost entirely of neutrons (subatomic particles with no net electrical charge....". Look up the definition of almost, please. Do you know the definition of "entirely"? Now link the two words together & you get a better picture of the definition used in Wiki for a neutron star, certainly Wiki is not suggesting a dismissive population of neutrons here, but rather a population of neutrons so predominant that almost nothing else is present.